Back from another fantastic week on the Somme. It is frightening to think I have been going over for a week virtually every March with my brother since 1985!!. 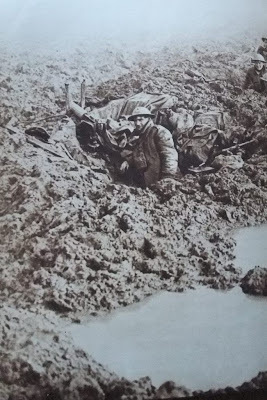 So a series of posts about this years trip - these are not intended as a 'History of the Battle of the Somme' in anyway but just a few highlights of the trip with some added snippets of history. We sailed form Dover to Dunkirk on Sat 18th allowing for a few hours in the Ypres Salient before arriving on the Somme in the early evening. This only really allowed time for a few visits to some cemeteries and bunkers. 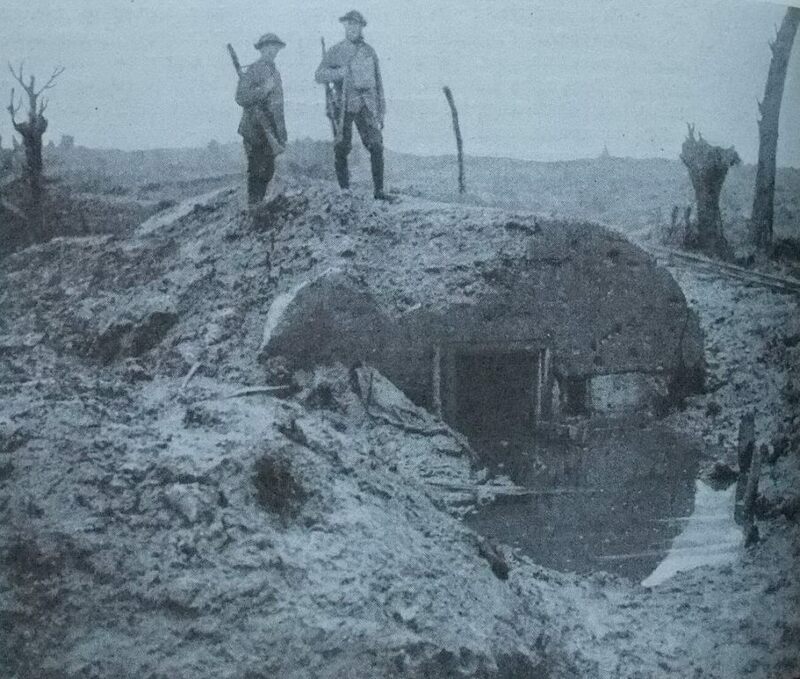 First of the big bunkers we came across was at a site called Goumier Farm (or also Gournrer Farm) on the Pilkem Ridge. This was basically a fortified Belgium farmhouse - the Germans constructed it by enclosing the brick walls in concrete. It was an excellent location with good views over the surrounding area and changed hands many times until finally captured by the 38th Div in July 1917. It was further fortified by the Royal Engineers (they added the blast walls). Subsequently it was to be captured again by the Germans before finally be recaptured by the Black watch. Another fortified farmhouse we visited was Hussar Farm. This was a British observation post fortified by the Royal Monmouthshire RE, again constructed inside an old farmhouse. We also came across another couple of reinforced concrete shelters - I found a picture of what conditions must have been like in such shelters. RE Wood was an interesting site. Sited on the Bellewaarde Ridge it offered good views over the British positions. Any ridge in the Salient was strongly contested - and the term 'ridge' in the Flanders plain has to be taken lightly - any slight rise of ground was a 'ridge'!. The area was obviously the site of mine warfare and also of an attack by the Liverpool Scottish (1/10th Kings Regt) on 16th June 1915 when they suffered 590 casualties killed, wounded or missing. A memorial to this action can be seen on the site. A little snippet of WW2 info - according to Rose Coombs excellent book 'Before Endeavours Fade', the area was also the location of a failed attempt by the Germans to establish a V1 Rocket launching site. Above: RE Wood Memorial and one of the mine craters still visible. Any visit to Ypres has to take in Passchendaele - even people with no or little interest in the First War have heard of this village. 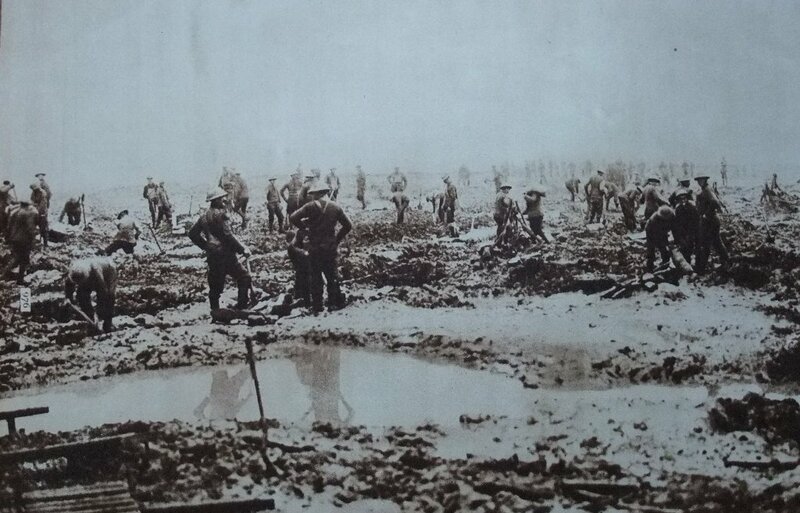 It is basically the area where the Third Battle of Ypres 1917 finally came to a halt in atrocious conditions. As I said these posts are not intended to be a history, we only had time for a visit to New Passchendaele Cemetery. Conditions were overcast and the black and white photograph I took actually looked the most atmospheric. Above: Passchendaele New Cemetery. Bottom two photos show the Canadians in line just before the attack in Nov 1917 and clearing up a few days after the capture of Passchendaele Ridge. Finally on the drive down to the Somme, crossing over the Belgium border into France we came across a massive British pillbox constructed during the Second War as part of the Gort Line (basically an extension of the Maginot Line constructed by the British). Above: British Pillbox on the Gort Line. Artists sketch shows British soldiers waiting by their guns ready to meet the anticipated German attack and recalls "the many months spent by the British Expeditionary Force in France in the latter part of 1939 and during the early part of the following year, awaiting events". Arrived on the Somme in time for a few beers at Bar Tommies in Pozieres before retiring to our hotel at Foncquevillers which we have been staying at far more years than I care to remember! Above: Hotel du Nord with a good meal and bottle of wine awaiting!